As a confirmed Grecophile of some long standing, no one knows better than me that the Greek language is not the easiest to pick up while grabbing a few, heaven-sent days in the sun. There is one word, however, that every visitor to Greece becomes familiar with, even if they never hear it, or learn how to spell it; and that is “philoxenia”. Its meaning is simple – ‘friend to a stranger’ – but its philosophy still runs deep through the psyche of the Greek people and has done since Odysseus was in nappies. In short, it is probably best summed up as good old-fashioned hospitality and it’s something the Greeks take very seriously. 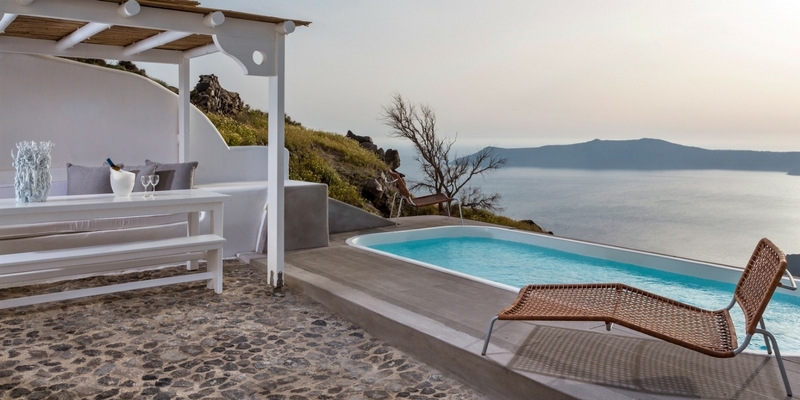 Nowhere more so, I found out, than on the fabulously photogenic island of Santorini, where the Katikies group of hotels welcomes both strangers and old friends with the kind of warmth and genuine joy that one usually reserves for favourite family members. You really are here to be spoilt rotten in the most wonderfully relaxed and jaw-droppingly stunning surroundings. The consistently marvellous staff just can’t do enough for you and yet manage to remain discreet, not in the least obsequious and well, just fun to be around. Each of the five fabulous hotels is different from the other, in size, in location and in vibe, but they all share a common soul and the same great big heart. Another thing they all share is fantastic food and wine. 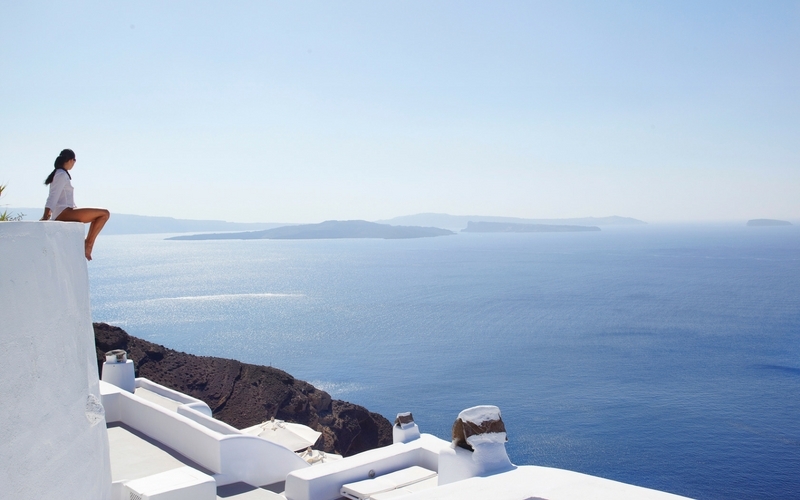 Santorini is celebrated for its great wine (who knew?) 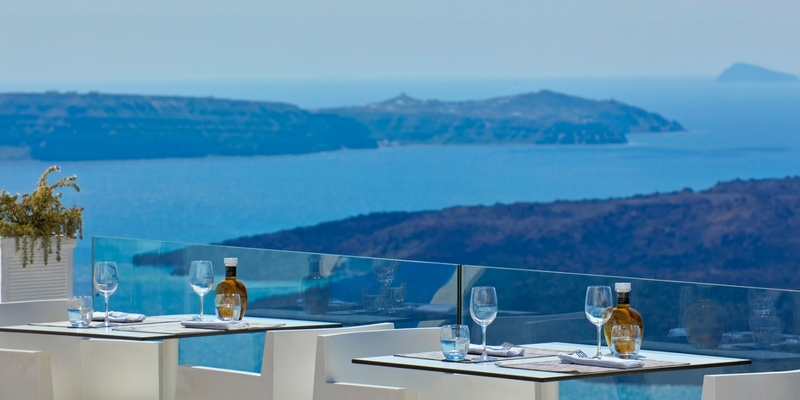 and all of the hotel restaurants show off some serious culinary skills with inventive dishes created from the freshest local ingredients, inspired by Greek and Byzantinian culture. 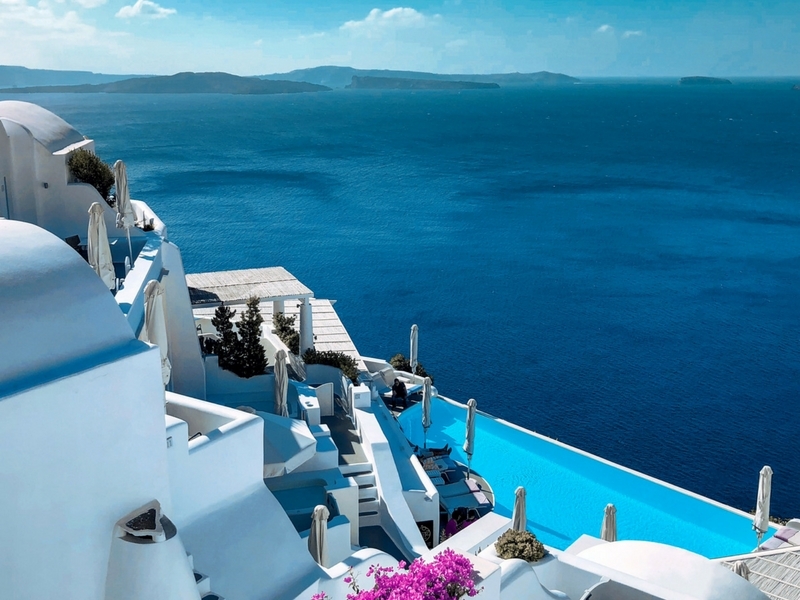 If you can’t find your holiday heaven here, I’m not sure you’d find it anywhere – the gods are definitely smiling on Santorini and so was I. 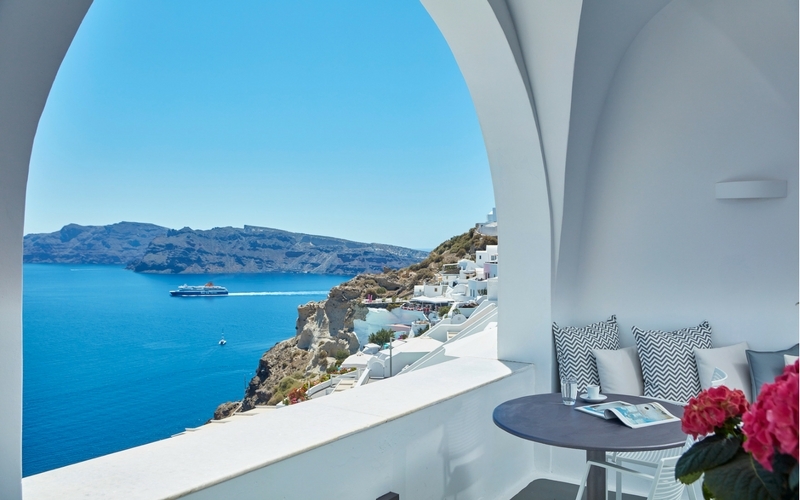 The flagship hotel in the Katikies group makes no excuses for its superstar status in Oia and is the inspiration behind Katikies Mykonos, which opens on the neighbouring island on June 1st 2018. With 34 divine rooms, ranging from ‘just gorgeous’ double rooms with spacious balconies and sea views to ‘get out of here’ master suites with private pools and jacuzzi, this bright, white beauty is the place to see and be seen. Three turquoise pools each offer a different environment; you can style it out at the super-trendy infinity pool with a cool playlist and a great bar. You can hang out upstairs where the music is lower and the mood more mellow. 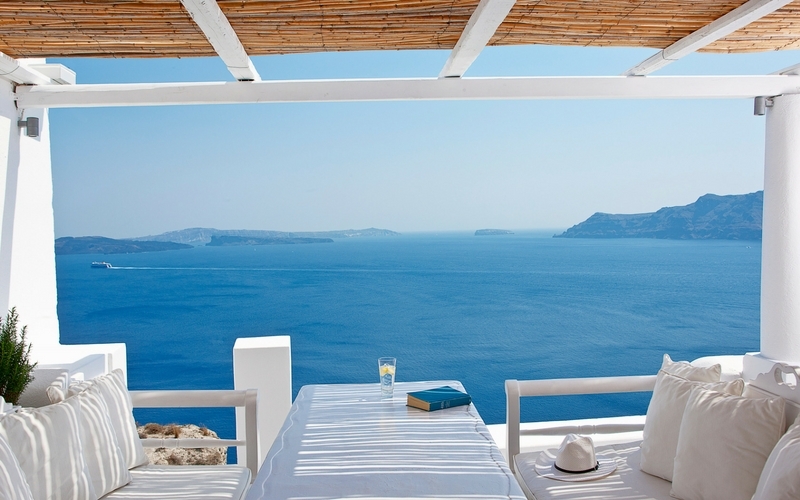 Or you can chillout at the quiet pool and just doze off to the sound of the waves. Bliss. Just next door, Villa Katikies is the best place to be for those who want to hide away from the party crowd, but be close enough to take advantage of all the hotel facilities when they want to. 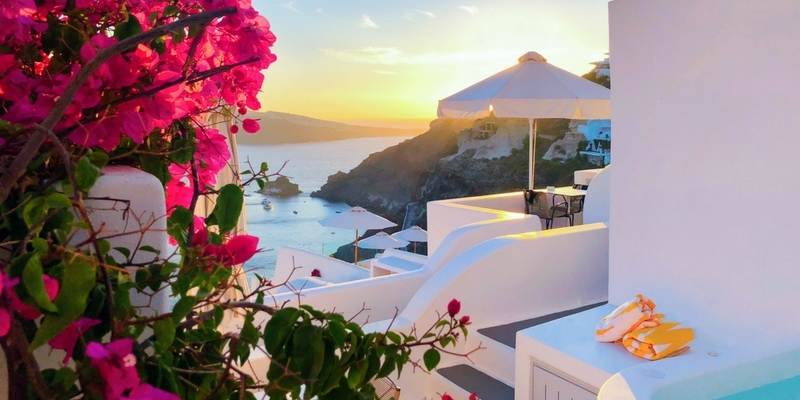 Boasting only seven double rooms and junior suites, all with large private balconies and private jacuzzi, villa stays include breakfast on your terrace, or at the hotel, and the smiling hospitality of the lovely manager, Eirini. 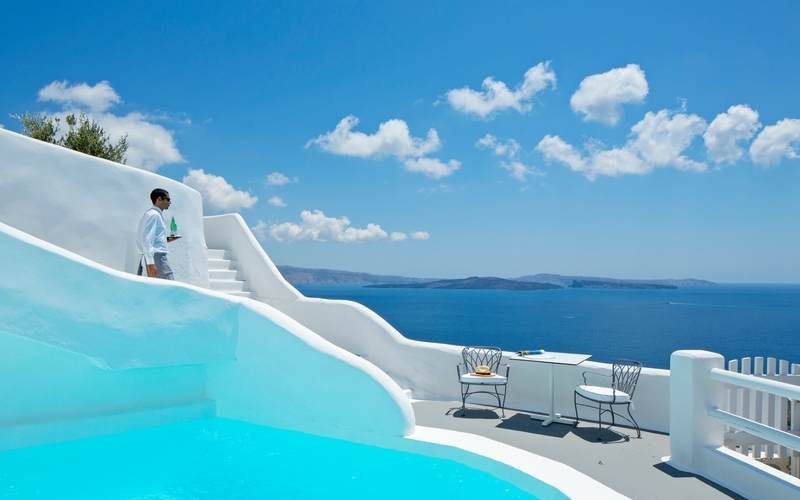 The private pool and pool bar have spectacular views across the Aegean and if privacy is what you’re seeking, exclusive hire of the whole place is available on request. Discreet, sophisticated and stylish, the elegant Kirini hotel rightly prides itself on its Leading Hotels of the World status and more than lives up to its promise. Run by the charming Alex, who seems to be able to spot a dropped napkin or an empty glass at a hundred paces, this is unadulterated luxury in sublime, yet understated, surroundings. The tranquil garden grows herbs and vegetables for the perfect poolside restaurant. 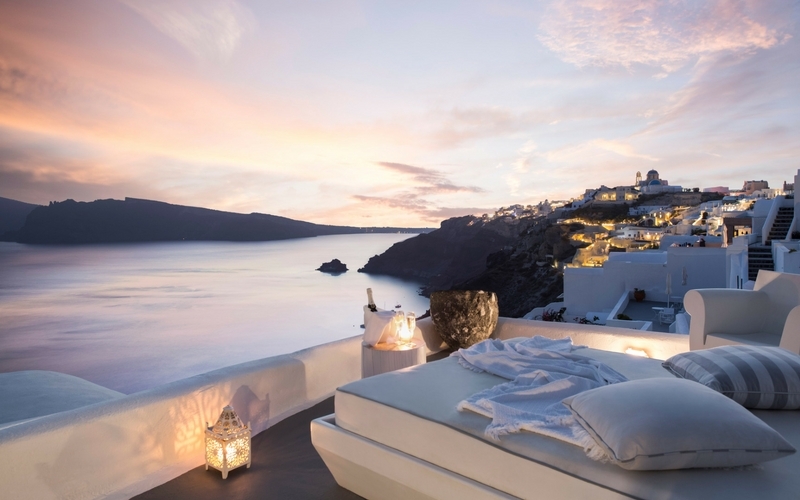 The breathtakingly beautiful spa, servicing all hotels in the Santorini collection, offers the most romantic couples treatment rooms and a chance to escape from the pace of every day life. 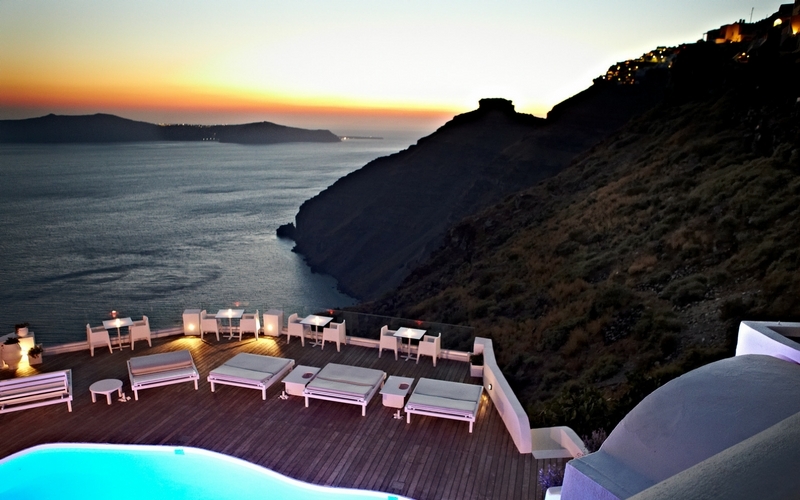 The 26 super-cool suites with the requisite awesome views of the Caldera provide the perfect sanctuary for grown-ups with great taste. There’s an effortlessly hip vibe going on at Chromata. Rather than the more obvious ‘in-crowd’ who likes to be noticed, this 27-room haven appeals to a very cool clientele with nothing to prove and everything to enjoy. 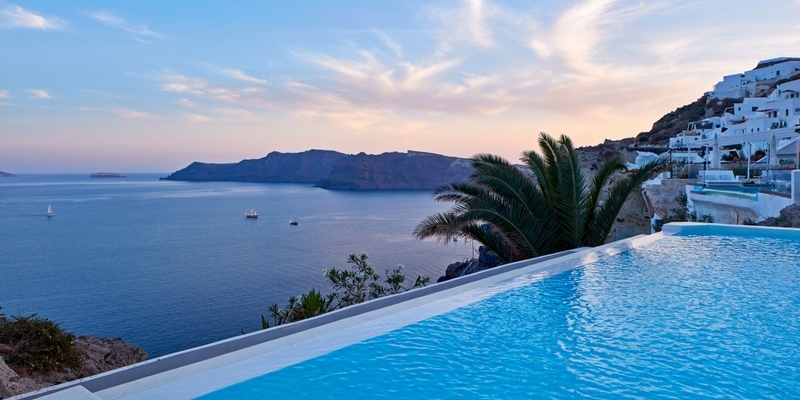 High up on the edge of the volcano, private balconies and a very easy-on-the-eye infinity pool overlook blue seas and stunning sunsets that appear to just melt into the water. Dining options include the well renowned Chroma restaurant where Manager Stefano excels in his recommendations and sommelier suggestions. Alternatively there’s the intimate sushi restaurant with just a handful of tables and views to die for. For perfect privacy, Chromata also has its own private cave house villa just a three-minute walk from the main hotel. It sleeps up to five people and benefits from all the hotel services. Seeing really is believing and this super-spacious, uber-stylish hobbit-like home is one of the coolest hideaways on the island without a doubt. If you can’t take a good photo here, it’s time to hang up the camera! 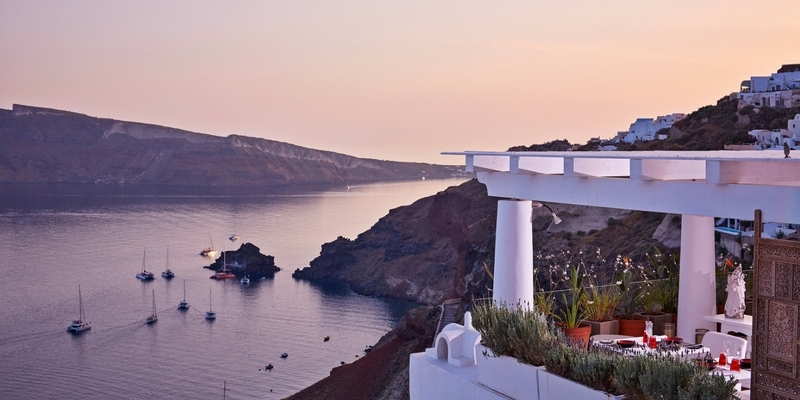 Even my iPhone couldn’t fail to capture the magic of the views from this higgledy-piggledy, clifftop delight situated just a 15-minute stroll from the party town of Fira. Not for the faint-hearted, Sunrocks has a serious amount of steps and no lift, but it didn’t seem to bother the young, good looking lovebirds that adorned the picturesque sun terraces and pretty, pool-side restaurant. 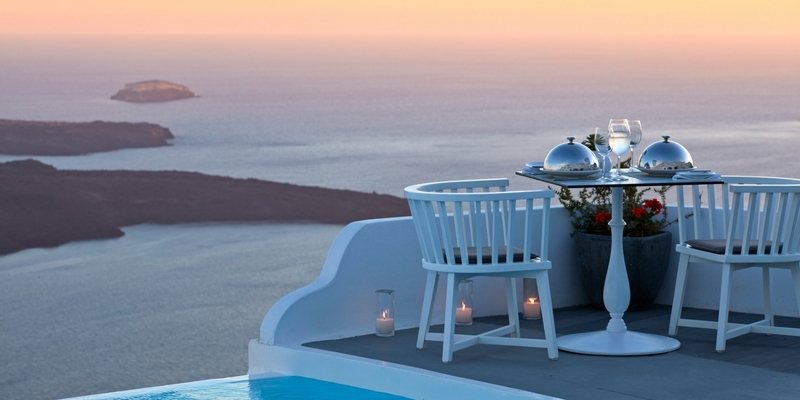 I’ve got to say, it’s worth the climb and made making the most of the fabulous Greek cuisine even easier to justify. Your Fitbit will definitely thank you for it! The 18 rooms and suites benefit from cool, minimalist interiors and private balconies with direct sunset views (many with private jacuzzis and/or pools, too). A chilled glass of wine and some chill-out music (all rooms have iPod docking stations) while you watch a red-hot sun slipping under the sea – life really doesn’t get much better than this. Katikies Club is a members’ only luxury lifestyle and concierge club that is open freely to all guests staying at any of the Katikies Boutique Resorts & Villas. The expert concierge team ensures that your stay on the island is a truly memorable and treasured experience by offering exclusive restaurant reservations, wine tasting experiences, sailing excursions, VIP access to museums and archaeological sites, high-end private transfers, private guided island tours and bespoke travel itineraries. This is available to all trade partners to book on behalf of their clients.